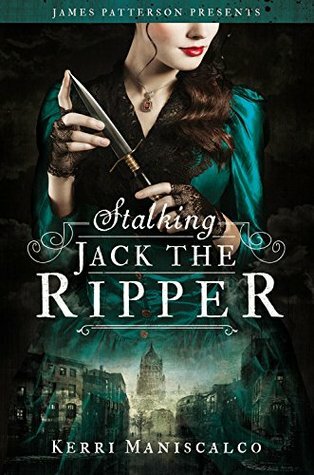 You can read my full review of STALKING JACK THE RIPPER by Kerri Maniscalco HERE. Since I didn't want the review to be too long, I've expanded on two of the issues I had with it in this separate post. I picked up this book expecting a well-drawn portrayal of a girl going against the expected social norms of women in an era that typically oppressed and caged women in stereotyped roles - but still within historical accuracy and the story's purpose. What I didn't expect was the constant preaching of feminism - obviously without ever using that word - in literally every second chapter. The heroine, Audrey Rose, never wastes an opportunity to preach about how women are entirely capable of looking after and thinking for themselves. But my issue's not with those facts at all; it's the blatant, unnatural hammering that doesn't fit the era that drives me insane. Oh, make the heroine strong and feministic by all means, but make it subtle if you're writing in this particular time period! It feels so unnatural coming from Audrey Rose, and I'm sure such constant hammering would be infuriating in any story, actually - it's way overdone. Not to mention there're only two other female characters in the book and one is the stereotypical aunt who's the epitome of a stereotypical, old-fashioned lady of the house, and the other is a cousin of Audrey Rose's who never quite gets redemption in her cousin's eyes. Yes, Audrey Rose does acknowledge how fun, feminine, and wonderful her cousin is, but that itself sounds forced by the author in the effort to explain and set straight common feminist misconceptions. It's like she's trying to pack in as much modern feminist relevance as possible, but it just feels forced and arrogant and haughty coming from Audrey Rose. "While I enjoyed finery, I tried imagining myself chattering on about a napkin design, but my thoughts kept turning to deceased bodies, and I laughed at my failure to even picture being a so-called normal young lady. I was determined to be both pretty and fierce, as Mother had said I could be. Just because I was interested in a man’s job didn’t mean I had to give up being girly. Who defined those roles anyhow?" Yes, those statements might be true, but they're too blatant and unnatural to work in a story set in this particular era. Audrey Rose is thinking ahead of her time, so to speak. "Perhaps I’d been wrong in my earlier judgment. It seemed it’d take a little more time for some girls to free themselves from chains society placed upon them." Another jab at the women around her. It comes across arrogant and demeaning in the context of this scene. "Liza had assisted in fabricating excuses to leave the house, telling her mother we were in desperate need of shopping excursions. Aunt Amelia was thrilled to have me doing “appropriate girl things” and sent us out, humming to herself. I suspected my cousin was willing to help because it afforded her time to sneak away to the park with her newest love interest. Regardless of her motives, I was grateful for her presence and would miss her when they returned to the country." So yes, Audrey Rose likes her cousin and praises her, but can you see the lofty arrogance and criticism that wafts through? It's like no other woman in this story is allowed to come too close to Audrey Rose's own feminist attitude; lest they outshine her. That's one of the few "feminist" passages that I think actually works. Audrey Rose is constantly pushing other women down - either blatantly or subtly - because they're not as intelligent or tomboyish or willing to test the limits as she is. That makes me furious. There are different kinds of strength, and I hate seeing women turn against each other because their idea of strength doesn't match someone else's. Audrey Rose also criticises - either deliberately or through subtle implication - "girly" tendencies like looking for a husband and "chatting over tea." It's arrogant and I think it's wrong. And I think it gives feminism a terrible name. The heroine's reaction to the deaths of the victims & the Ripper's character in the aftermath of the confrontation. This is a hard thing to explain without giving spoilers, but I'll try. When Audrey Rose finds out who the Ripper is, she's obviously shocked and appalled. But she's more concerned for him than for what he did to the victims. The focus is on him and his brokenness, and it comes dangerously, dangerously, close to being an excuse for his gruesome violence towards the victims. I'm furious. Yes, he's going to be messed up and in need of help and yes, I know he's broken, but in no way can you be on his side when it comes down to it. The women were gruesomely mutilated and abused before he killed them, and if I knew someone close to me who'd committed such atrocious acts, I would definitely be shocked, but I would also be angry more anything else. I wouldn't want him to get away with it, and I wouldn't want to help him escape justice. He'd need serious help, but he needs to pay for what he's done. The victims come first - always. But Audrey Rose's hurt for them is frighteningly inconsequential compared to her agony for the murderer. But on the other side of the argument, there is evidence for Audrey Rose's concern for the victims. throughout the book as the bodies are discovered, she does say how angry it makes her and how awful it is, but one again that comes across unsympathetic and forced because of her character and the writing. It is, again, Maniscalco trying to have her modern feminist heroine stand up for all women and address the injustices inflicted on them by society. But it doesn't work, because it's forced and preachy and trying too hard. It's a wasted opportunity, and wasted because of how badly it's written and thus how it comes across. In conclusion, I think Stalking Jack the Ripper is one of those books where its aspects are so interlinked that if one of them is slightly off or offensive, it contributes to all the other aspects and affects them too. It's a fun read, but I think its flaws are serious and worth mentioning. And the character of its heroine, Audrey Rose, is a huge part of those failings. Thanks for reading this slightly ranty and very long post!